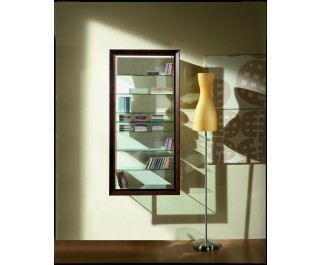 Wall-hanging cabinet with structure in float transparent crystal glass with wall fixing system; back in lacquered crystal. The frame can be supplied in wood with wengè, aluminum or white lacquered finish, in white or black lacquered crystal or in satin finish anti-finger print crystal glass in the following colors: lillac, sand, grey or white. Bacheca is available in two different sizes and in open version or with tempered crystal door, with key-lock. Constant research activity in materials and design, assiduous attention to details and high standard procedures in the manufacturing process are the bases of Urbinati's way of working, together with a flexible policy which focuses on the customer and his special needs. Starting from glass, however versatile and enchanting it may be, the new projects are oriented towards experimentalism and try to combine new materials. The forms which only yesterday were judged as daring combinations are considered today the interpreters of contemporary design culture and have consolidate Urbinati's reputation all over the world.